This mantle was 100% inspired by the kids. 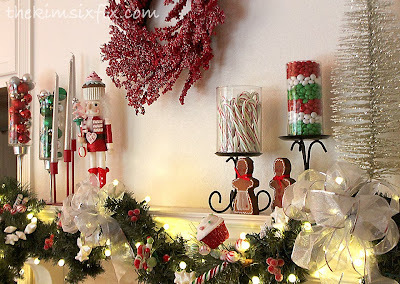 They wanted a "candy" themed mantle for Halloween (a cute idea actually, I just didn't have any cute Halloween candy at the time), so instead I told them we could do the playroom mantle in candy for Christmas. 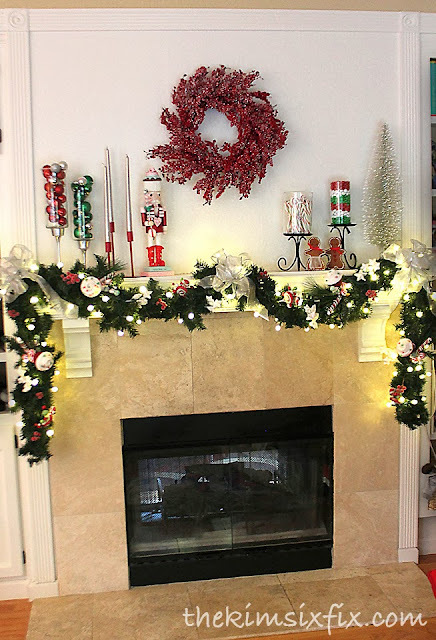 Like most all of my Christmas mantles here, here, here (maybe I should change it up a bit!) 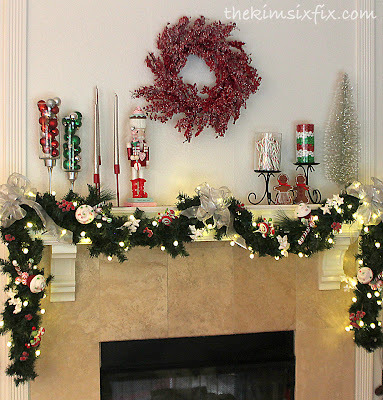 I draped the fireplace in lit garland (this is my first mantle using LEDs and these are little spheres which I thought were cuter than the mini-lights for this design) and then added some christmas candy floral picks I picked upon sale at a local craft store. 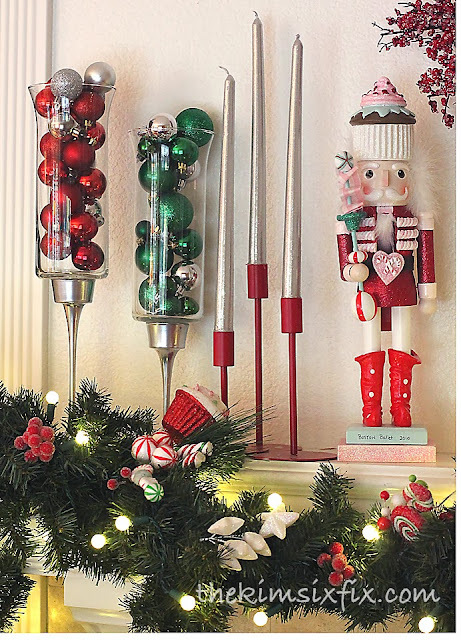 On one side I used my new dollar store hurricanes I shared yesterday along with a candy themed nutcracker and some silver taper candles. 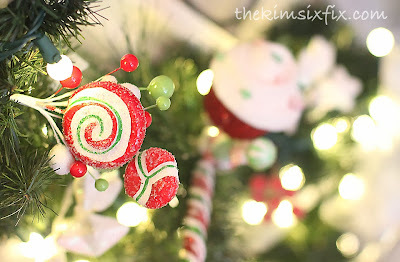 The other side featured real candy canes and holiday M&Ms (these are actually the holiday mint ones!) I got the wooden gingerbread people from my mom a long long time ago. 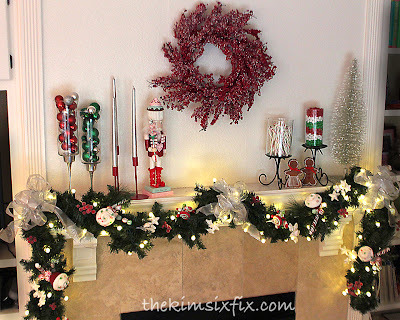 For height I used a silver bottle brush tree I had from last year which matched the silver bows on the garland. 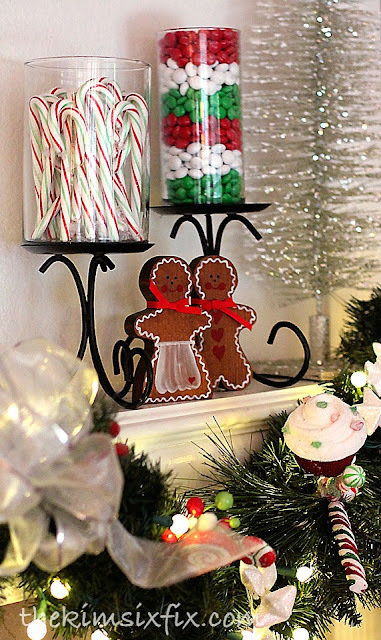 It came out cute, and the hardest part about the whole thing is keeping the candy from being eaten! Sharing at my favorite parties.